Brandon Graham is embracing the bust label, but the joke he’s pulling is going to be on those that gave him the moniker. Photo by Scott Stuart. With only days away from the start of the NFL regular season it means time is running out for us to project our hopes on the league, its teams, and its personnel. If the NFL genie granted me 20 wishes (Jimmy Johnson helped me negotiate this deal for the Genie’s right to Trent Richardson), here’s what I’d wish for. It might not have looked like to to some last year, but Daniel Thomas as Michael Turner-like potential. I like what I’m seeing enough that I wish he’ll see the field in 2012. 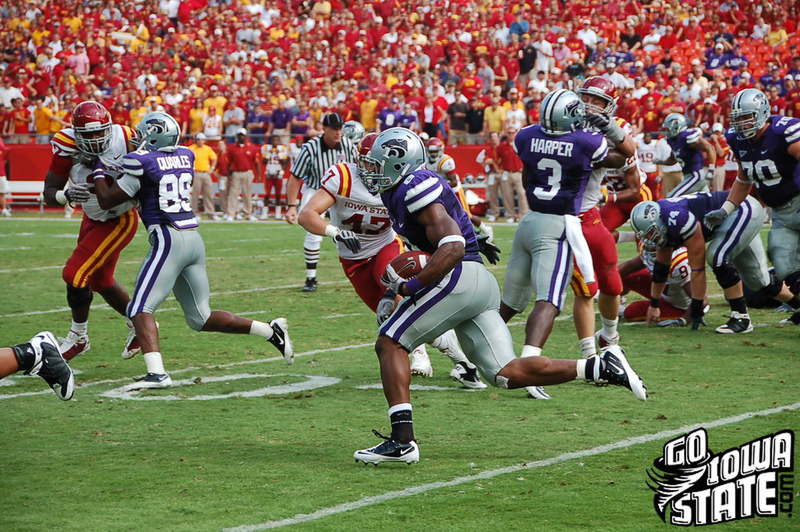 Photo by Go Iowa State. 20. The Dolphins up-tempo offense of Joe Philbin’s takes off: I know what many of you are thinking, I’m wishing for success in Miami because I’m a believer in Ryan Tannehill. This is only partially true. Tannehill is showing poise, signs of decent accuracy, and the willingness to attack down field during his preseason starts. But the reason I want to see Miami’s offense take off is that I don’t want to wish for Reggie Bush to get hurt or his play to struggle. And unless Miami fulfills its offensive potential those are the only two options for second-year running back Daniel Thomas to see the field. Thomas has gotten into shape and he’s done enough in the preseason for me to see a lot of the physically imposing runner that I saw at Kansas State. Thomas looks quick, decisive, and strong between the tackles. He has a little bit of Michael Turner to his game. Once upon a time there was a receiver from Michigan with elite potential…photo by Jim Harper. 19. Braylon Edwards will finally play to his potential for more than one year: I hate to see wasted talent, which is why the presence of Edwards on a football field frustrates me. Edwards had the talent to rival Andre Johnson. Now he’s fighting for a roster spot on his fourth team. Right now, Edwards (on his healthy knee) has looked a lot like the player that the Browns drafted and the Jets and 49ers hoped they could rejuvenate. Better yet, he’s matched with a fearless rookie willing to target him down field in situations where Edwards wins the ball. I don’t know if Edwards can beat Golden Tate for the split end spot, but I do know that Sidney Rice has never been the paragon of health. I think Seattle could be the most exciting city for NFL football in 2012. 18. The Tennessee Titans defensive front looks as good in the regular season as it did against an over-matched Arizona Cardinals offensive line: Kamerion Wimbley, Jurrell Casey, and Derrick Morgan were especially impressive this week and for the most part the preseason as a whole. Morgan was considered by many the best overall defensive end prospect of the 2010 Draft before his knee injury. This is the Titans best chance to win the division before Andrew Luck gets fully acclimated to the NFL. If Tennessee wants to maximize its opportunity, the pressure from the Titans’ front four is a must. 17. Eagles defensive end Brandon Graham continues to embrace the bust label: While Jason-Pierre Paul had a higher physical ceiling, Graham was a safer, but almost as impressive prospect. A state champion sprinter in high school, Graham reminds me of a stronger, quicker Elvis Dumervil. 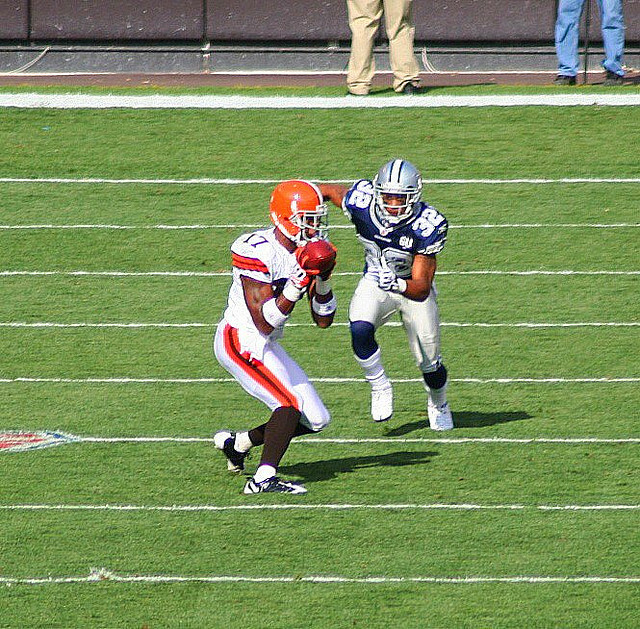 After an ACL tear robbed him of his skills from the end of 2010 through the 2011 season, Graham told the media that he was going to embrace the label that he was a bust. The way Graham has played in the preseason, the only bust he’ll be embrace could be a trophy. If he plays to his potential, that bust could be one in Canton. Calm down Hall of Fame Police, I’m only talking about his potential. If I wrote to my potential, I could pen a bestselling novel. It doesn’t mean I will. 16. Jay Cutler doesn’t get killed: The Bears offensive line isn’t making life easy on Cutler, who will once again have to play football at the highest level in sand while the rest are playing in grass. For non-Bears fans, Chicago will be one of the most fascinating teams to watch this year if solely for the purpose of studying a passer’s talent to make plays under pressure. I’m afraid Cutler is fast becoming the most talented quarterback wasted by his team this decade. 15. I saw the Eagles Nick Foles when I watched the Wildcats version: Poised, mobile, and accurate. That’s the quarterback I’m seeing in the NFL. It’s not the quarterback I saw with nearly the same consistency from play to play in Arizona. Makes me want to go back and see what I missed. He might be as impressive as any rookie quarterback not starting a game in the Pacific Northwest. Then again, I’m wondering how much Cleveland was actually doing in this third preseason game, considering they see the Eagles again in the regular season opener. 14. Jonathan Vilma is reinstated before the season starts: Forget the evidence for a second and just read the recent behavior between the Saints linebacker and commissioner Rodger Goodell. The fact that the NFL offered to reduce Vilma’s suspension in half tells me that there’s some private concession from Rodger Dodger that he was hasty with his discipline. The fact that Vilma told Dodger to stick it up his hind parts tells me that the player wants his name cleared. Look at it this way: Vilma is to Adrian Peterson as Goodell is that Barney Fife-loving Houston cop. 13. My team had Melvin Ingram: Chargers beat writer Kevin Acee says the rookie outside linebacker reminds him of a bigger, badder Shawne Merriman with his head on straight. If I were writing my Futures column at Football Outsiders last year, the Melvin Ingram-Jadeveon Clowney tandem would have been a duo I wrote about on Halloween. Only The Shining is a scarier horror story. Ingram will be on the field plenty as a rookie and I have a feeling it won’t be long before the Chargers have to shuffle its lineup to keep him there. He’s a devastating weapon who I hope stays healthy for a long career. 12. Chad Spann earned an opportunity to join a team: Anthony Allen, Damien Berry, Javarris James, Tashard Choice, Antone Smith, Dimitri Nance, Dan Herron, Aaron Brown, Josh Vaughn, Brandon Jackson, Chris Ogbonnaya, Kahlil Bell, Lorenzo Booker, Jeremiah Johnson, Lance Dunbar, Justin Forsett, Keiland Williams, Brandon Saine, Montell Owens, Dujuan Harris, Lex Hilliard, Jordan Todman, Shaun Draughn, Chris Ivory, Steve Slaton, Da’Rell Scott, Andre Brown, Joe McKnight, Terrence Ganaway, Daryl Richardson, Lonyae Miller, and Mossis Madu. That’s just a partial list of running backs on NFL depth charts that I believe aren’t as talented as Spann. 11. I wish Drew Brees had a real primary receiver: No disrespect to Marques Colston, who in my eyes is a big-bodied slot receiver in an offense where he can thrive as a primary wide out, but I’d like to see Drew Brees throwing the ball to Jordy Nelson, Greg Jennings, Brandon Lloyd, Roddy White, Hakeem Nicks, Andre Johnson, or Calvin Johnson. Heck, I’d settle for Dez Bryant and his erratic young career. 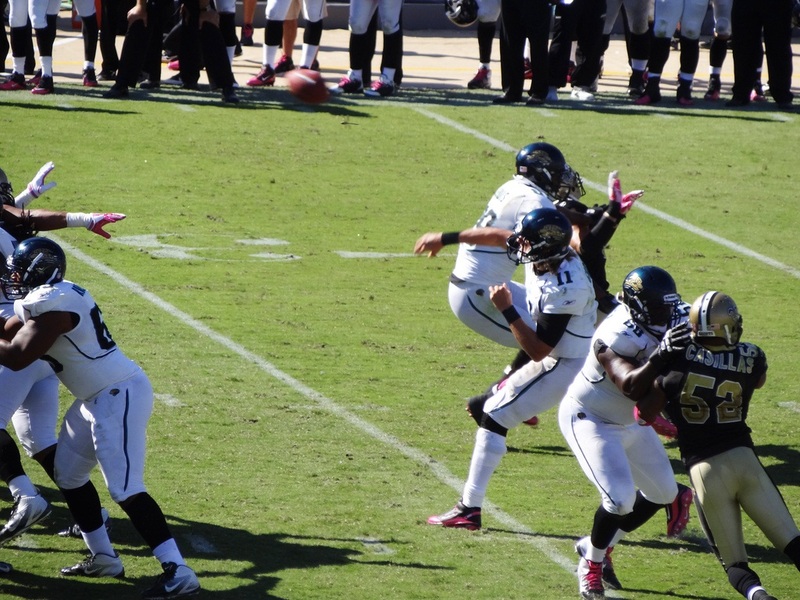 Brees is the best deep-ball thrower in the game and his best vertical target on the outside is Devery Henderson. It’s like those gigs when Charlie Parker had a plastic horn or the equivalent of giving a plastic surgeon a steak knife. 10. Larry Foote was suspended for the year: Football is a rough game. I embrace that and accept it. However, if the NFL is going to suspend Jonathan Vilma for a year, might as well as add the Steelers’ linebacker to the list after last weekend’s hit on Austin Collie. This was not a bang-bang play. Foote aimed his elbow to the helmet of the Colts receiver while Foote’s teammate had Collie wrapped from behind and immobilized just enough for the linebacker to deliver a loaded forearm. Steelers fans and media claim it didn’t look egregious. I’m not picking on Foote any more than I’d pick on any other NFL player, but there’s a line between an unavoidable hit and a deliberate attempt to aim an elbow/forearm to the side of the head. Either you suspend Foote or reinstate Vilma. Of course, I wish I could say conclusively that Leon Washington’s low block of safety Eric Berry in the open field during a Russell Wilson scramble on Friday night was as intentional as Foote’s hit. I’m willing to entertain the idea. 9. LaRon Landry stays healthy all year: The Jets newest acquisition is too good of a fit in its variant of the 46 to miss him play due to injuries. Landry has range, smarts, and he hits like piano dropped from a fourth story window. 8. Brett Farve comes back: Just kidding. Sort of. He might cause more melodrama off the field than a Jerry Springer episode, but on the field he’s Marlon Brando. 6. Robert Griffin learns what Michael Vick hasn’t: I’m a big Robert Griffin fan. I haven’t made this known until now. The reason is I love his combination of athleticism, intelligence, and guts. However it’s the last part of the equation that scares me. Griffin has that Vick-like ability to heave the ball with all arm from awkward positions at the last second from a crowded pocket. This athleticism inspires confidence to make these plays and take tremendous punishment in the process. If Griffin stays healthy this year it’s because he has learned to throw the ball away earlier and avoid the huge hit from a vulnerable position or Evoshield’s body armor is that good. Great player, bum wheels, Thomas Davis earns this year’s Make-A-Wish Foundation award from the RSP blog. Photo by Noah Wood. 5. Thomas Davis plays the entire season at a high level: When he was a safety at the University of Georgia, the Carolina Panthers linebacker was one of the hardest hitters I ever saw. Now returning from his third ACL tear, Davis will play Sunday night against the Jets. You have to love determination. 4. Adrian Peterson is Santa Claus, the Easter Bunny, and the Tooth Fairy in shoulder pads: I might be skeptical, but I want to believe. 3. Ndamukong Suh makes like Mean Joe Greene and learns to play with emotional self control: Suh was a terror in 2010, but last year he let his emotions get the best of him and his play suffered. 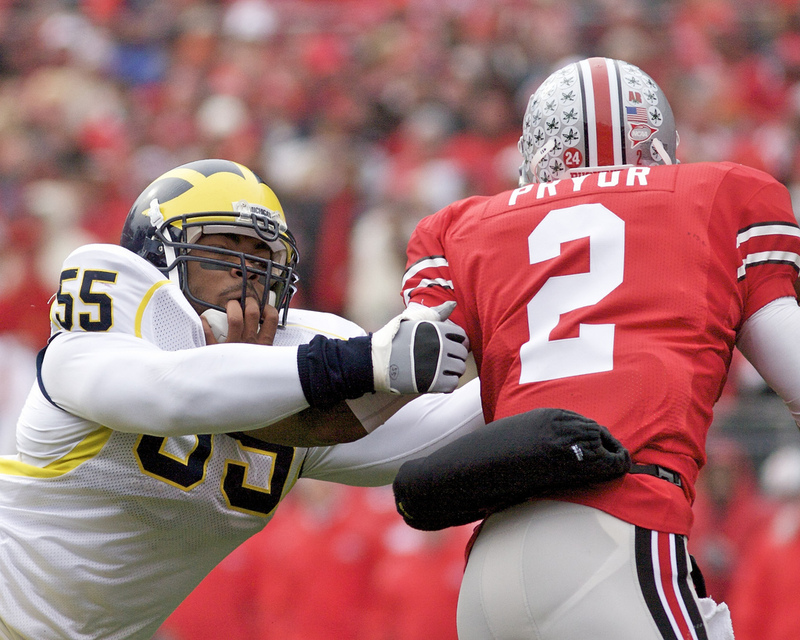 Suh wasn’t the only great defensive tackle in the game who needed to mature. Of course Joe Greene played in an era where acceptable play would earn The “No.1 Stiller of all time” a suspension today. For the sake of clarity, let’s just say Suh needs to mature relative to Greene’s growth in his era. 2. Peyton Manning plays close to his old self: Nothing is more exciting than watching an older quarterback show the original magic with a different team. Joe Montana and Brett Favre did it. Let’s hope Manning is healthy enough to get the job done in Denver. 1. Russell Wilson slams the door shut on the NFL’s case of Flutiephobia: I’m not writing this to say that the NFL should consider every quarterback prospect under 6’0″, but Wilson is the same example of a player that Brian Westbrook was according to Gil Brandt: “if he were two inches taller and 10 pounds heavier, he’d be a top-10 pick.” This is essentially the same thing said of the college captain of two major conference football programs. Wilson has everything you want but height: the arm, accuracy, aggressiveness, smarts, mobility, toughness, and leadership. In fact, leadership might be his best quality and that’s something I’ve rarely discussed about him because I didn’t want to be pegged as a guy lauding a quarterback’s intangibles where there was so much more to praise about his game. Wilson’s 13/19, 185-yard, 2-touchdown effort in his first preseason start that included 58 yards on 2 carries is a great start, but far from conclusive that he’s going to be a great NFL starter. While I believe it, this story is just beginning. And I can’t wait for it to begin. Very timely and very entertaining. Thanks, Matt!